We have just posted another terrific Feature Car. This one is owned by Barry Miller and is an actual 1968/1969 Holman and Moody. We photographed this car at the Monster Mopar Weekend in St. Louis during the 2008 event. 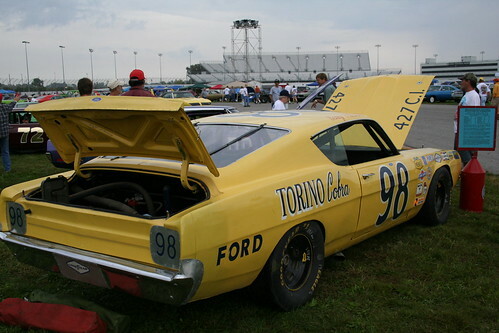 Certain Fords were allowed to participate as part of the Winged Car (Daytona and Superbird Club activities).The is not pristine with immaculate paint and body but it is beautiful. The 427 sounds terrific (watch the video and listen for yourself) and the pure rawness of the race car makes you quiver. Unlike today, the race cars were not massaged to a silky smooth finish. When they started a race they often carried the scars of the previous race. You have to remember that in those days there were a lot more races and some of the drivers would compete in multiple events during a weekend. There was no time to do minor body work and repaint. These were race cars and not show cars. For more information an dozens of photos on this car go to our Feature Car page by Clicking Here. Here is Benny behind the wheel back-in-the day!